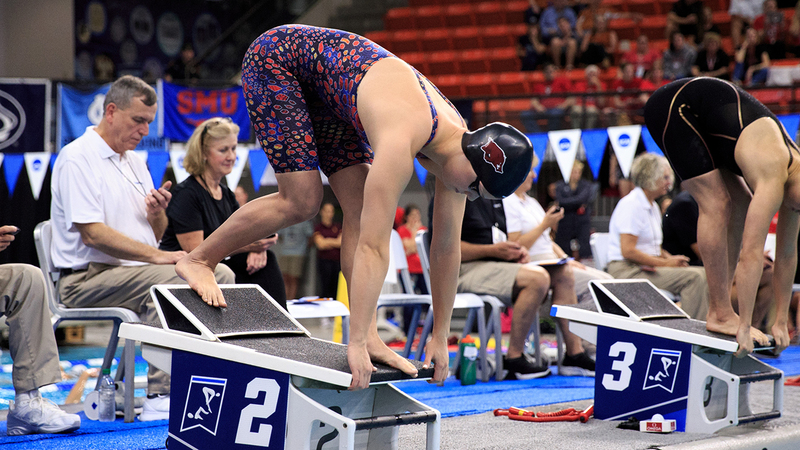 AUSTIN, Texas- In the first day of competition for Arkansas at the 2019 NCAA D1 Women’s Swimming and Diving Championships, Anna Hopkin and Brooke Schultz earned top-5 finishes and All-American honors. The Hogs opened the second day of the meet with a 21st-place finish in the 200 yard freestyle relay, with Kobie Melton, Hopkin, Molly Moore, and Marlena Pigliacampi recording the fourth-fastest time (1:29.96) in program history. Peyton Palsha kicked off the individual events with the 500 yard freestyle, finishing in 55th place with a time of 4:48.51. Hopkin was the first Razorback of the day to advance to the finals, taking fifth (21.63) in the 50 yard freestyle in the preliminary round. The Preston, England, native earned a fifth-place finish in the finals, setting a new program record with a time of 21.51. Schultz was the second Razorback to advance to the finals, earning a second-place finish in the 1-meter preliminary round with a score of 331.70. The Fayetteville, Ark., native earned a fourth-place finish in the finals (334.35), five places ahead of her finish last season. Following Thursday’s competition, Arkansas sits in 18th place with 29 points. The Hogs will return to the pool tomorrow, with the 400 yard IM preliminaries at 9 a.m.